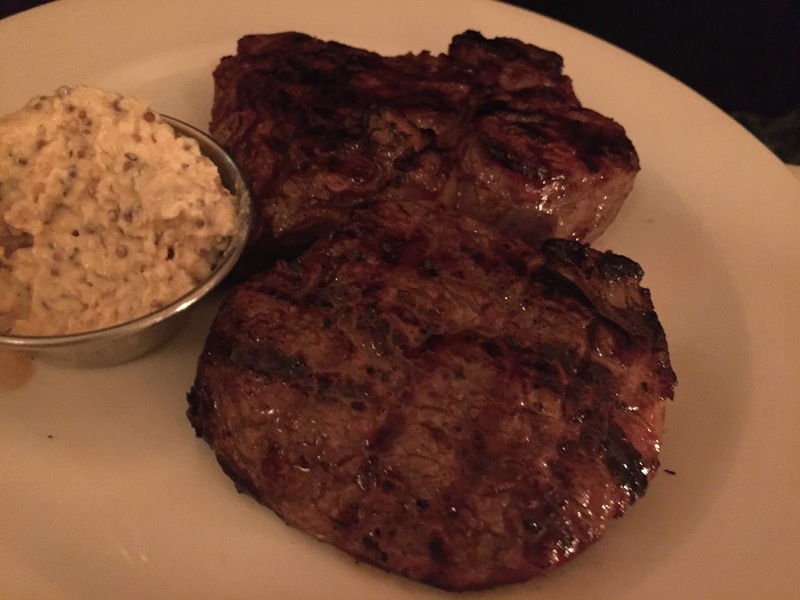 Hill & Szrok began life on Broadway Market as a butchers and "cookshop". A cookshop, since you ask, is apparently a 15th century precursor to the restaurant, where you would choose your sausages or pork chops or whatever and, as an alternative to taking them home to your hovel and cooking them yourself, hand them over to be cooked for you and eat it elbow-to-elbow with fellow peasants at a communal table. There seems something very 21st-Century hipster about reviving a 600-year-old dining concept in the East End of London but by all accounts it was a great success. So much so, in fact, that they've expanded (slightly) West to a handsome old building recently vacated by the 3 Crowns near Old Street station. Inside, the layout hasn't changed much since the 3 Crowns days. There's a pubby bit at the front which catches the post-work crowd (or at least would do if it opened before 6:30pm; maybe that's the plan eventually), a large open kitchen towards the rear and a more restaurant-y dining area with a number of tables charmingly draped with paper tablecloths. The two concessions to the new owners are an impressive glass drying cabinet hung with huge chunks of aged red meat, and - less impressively - a large, marble communal table. It's a beautiful piece of furniture, don't get me wrong, it's just that I put "communal sharing tables" just below "chicken pizza" on my list of Things I Don't Want In A Restaurant. Fortunately, we didn't have to sit at it. 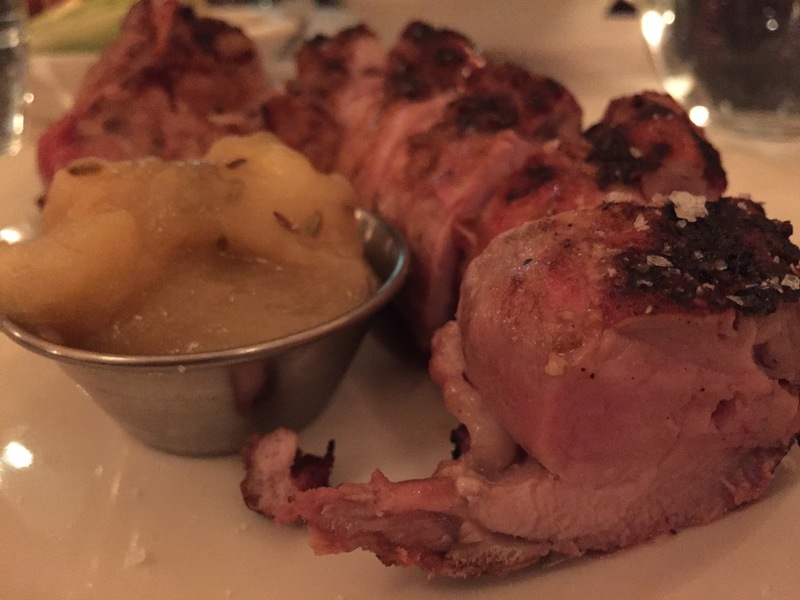 The menu is short, and attractively priced. 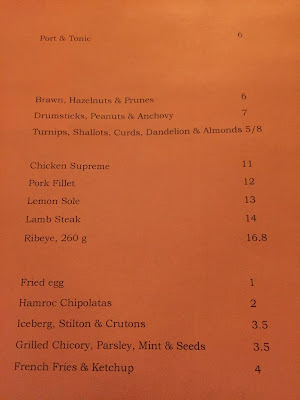 "Brawn, hazelnuts & prunes" sounded like the kind of thing I may have ordered in my slightly younger and more experimental days, but I've eaten enough wibbly bits of brain to finally decide that, in fact, I just don't like the stuff very much no matter how well it's cooked. 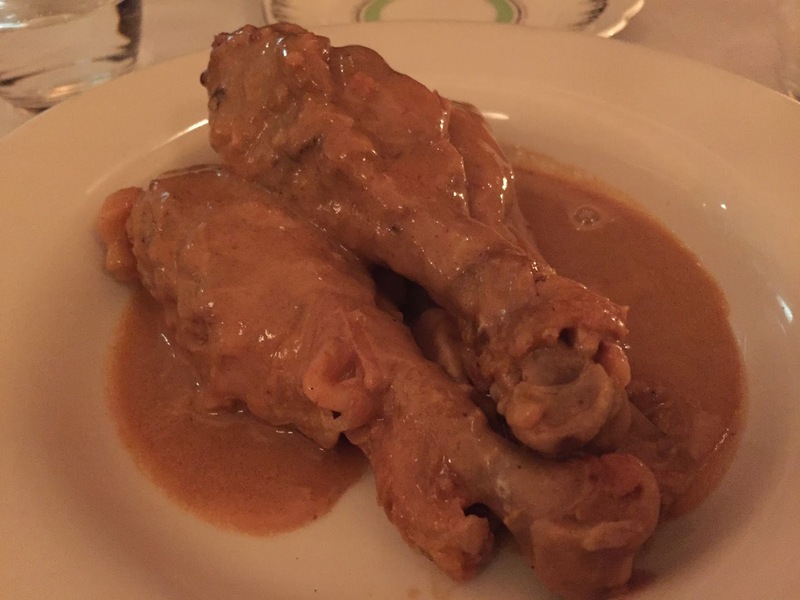 So we decided to share the "Drumsticks, peanuts & anchovy", and choose a meaty main each. The good news in the starter was all down to the sauce, an intriguing mix of seafood and silky, nutty cream that sat halfwhere between a satay sauce and bagna cauda. It was just the right side of unsettling for me; I loved its rich umami hit and the fact that I'd never really had anything like it before. However I should also say that my friend didn't like it at all, so make of that what you will. What we could both agree on though was that the chicken itself was horribly overcooked into a formless mush, meaning all the effort put into the sauce was pretty much wasted. Ribeye was probably the best of the mains; a tender and beautifully-cooked piece of grass-fed (I assume) beef, perfectly medium-rare and worth every bit of the £16.80 it cost. The horseradish mayo was a bit weird but then horseradish usually is; at least this was otherwise a straightforwardly enjoyable bit of cooking. Pork fillet was also good, similarly unadventurous but similarly enjoyable - seasoned well, just pink in the middle and showing nice signs of char on the outside. There was plenty of it, too. Perhaps I was expecting a bit more flavour from the pork from an outfit that began life as a butchers but then maybe that's a bit like expecting a builder to have exquisite taste in interior design; they may have all the right tools at their disposal, but making the most of them is another thing entirely. 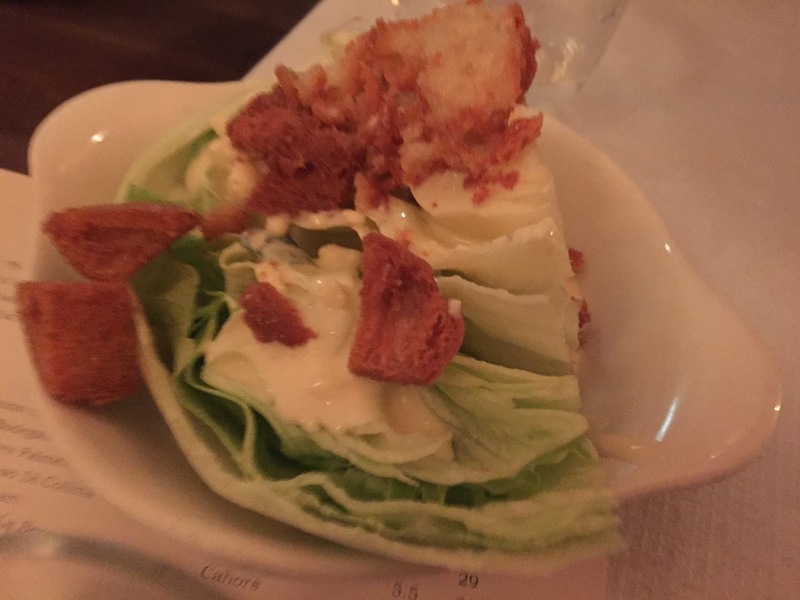 Wedge salad (sorry, "Iceberg, Stilton & crutons") would have been nicer had the lettuce not been straight out of the chiller, but even then would have paled in comparison to the Masterwork that is the Chick'n'Sours version with its thick St Agur dressing and bits of crispy chicken skin. Maybe it's unfair to compare the two, especially as the Hill & Szrok version is nearly half the price, but I'm just relaying what occurred to me as I worked through the icy cold blandness wishing for something better. 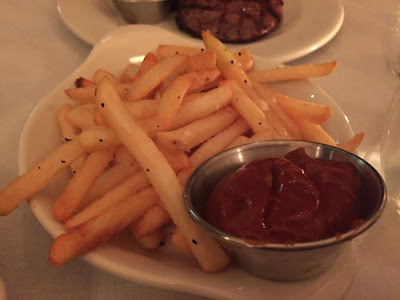 Fries were nice and crunchy though, and I even enjoyed their chilli ketchup despite my prejudice about messing with Heinz. 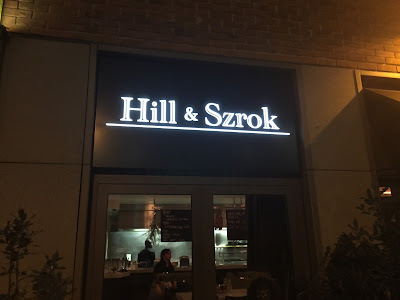 So, not perfect, then, but it would be wrong to say I didn't enjoy my meal at Hill & Szrok, despite the occasional weirdness. 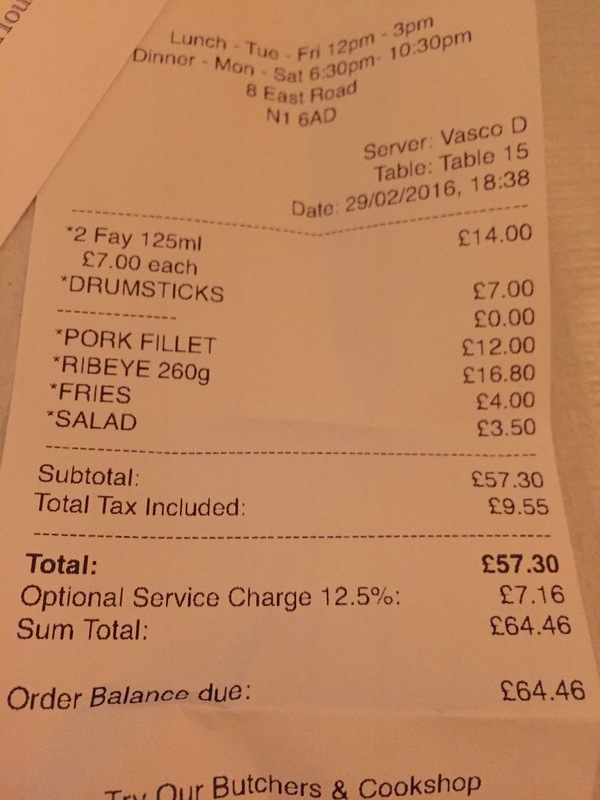 And also, £32 is not that much to pay for a two-course dinner and a glass of wine in central London, where you can still throw a similar sum at a steak and chips at any number of pub menus and be served something fairly nasty in return. 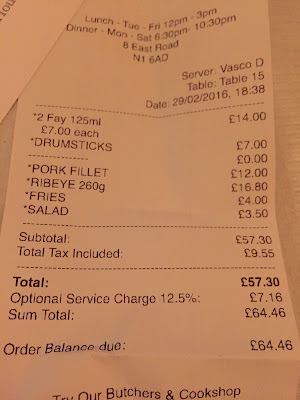 It may not have made it onto the "Must Visit" list, but it has made it on to the "If You're In The Area And It's Open And You've Not Got Time To Walk To MeatMission" list. And given how often I find myself in that situation, I'll most likely be back. 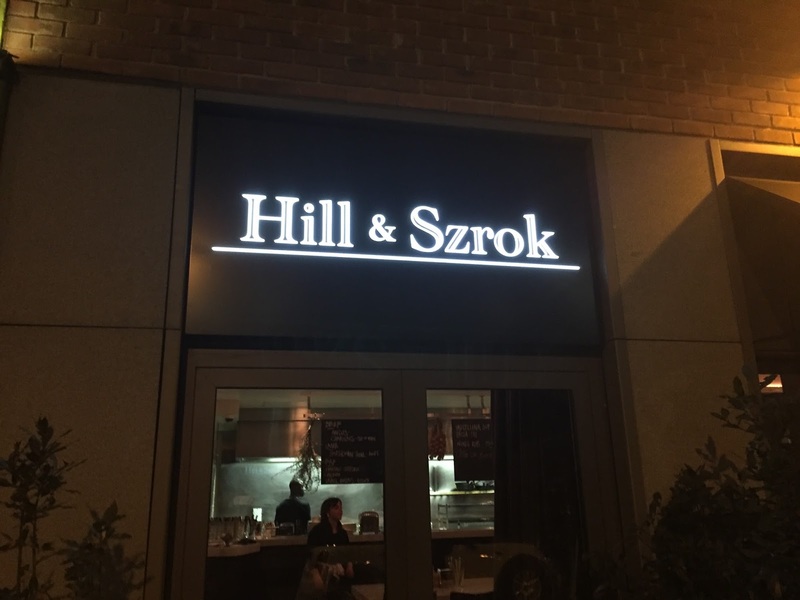 Hill & Szrok probably won't make it onto the app, but why not have a look what else is in the area? 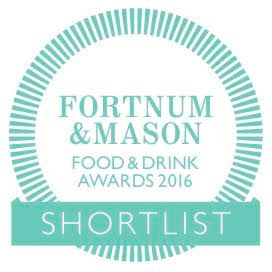 Download Where to Eat in London 2016 today! Do people eat chicken skin on drumsticks when it's covered in sauce so obviously not crispy anymore? IF you had been given that salad in a Frankie and Benny's you would be slaughtering them now. Just because its a small, trendy business doesn't mean they should be treated any less. Not sure that there's any brain in brawn, Chris. I think it's traditionally the meat of the head, but not the grey matter.